In October 1903, Mortimer Menpes published a book entitled “Durbar”, which not only told the tale of his attending the Durbar but illustrated it in painstaking detail. From the pages of this wonderful book and the photographs of Gertrude Bell comes the inspiration for the new Durbar range by W. Britain. 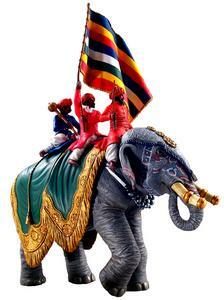 Described in Menpes own words, here is the arrival of the Jaipur Elephant: “a huge elephant hung with emerald-green and surrounded by mahouts clothed in crimson, loomed into sight. For two whole hours this band of colour circled round the arena.” This set is sculpted in the new high detail style with connoisseur painting that shadows and highlights every wrinkle and fold. An additional five sets are planned for the first part of 2009 and are shown here in the form of illustrations from the Menpes book (Photos of the actual figures will be shown in the Spring). Retired January 2012! Order Now!